Working is stressful. And for many, it’s an unavoidable part of employment that we just have to deal with from clock in to clock out. For others, it’s something that needs to be dealt with and rid in order to be able to function more efficiently. A lot of us may love our job, a lot may not, but the fact remains that there is a level of pressure that we go through every day in our working lives. This is where crystal healing takes place. Gone are the days when crystal healing is a concept subjected to the out-dated stereotypes of hippies and malicious conmen disguised as psychics to fool the gullible, the returning surge of crystals and their uses have found their place within the modern world of employment and those who believe and find solace in them. Due to its deep and rich black colour, black tourmaline is very effective when it comes to all sorts of negativity, from psychic attacks, stressful workload, toxic crowds and physical pain. Bringing black tourmaline with you to work can also help you repel any unnecessary negative energy that can then open you up for more of the good stuff. When experiencing strain or pain in your body, putting the stone where appropriate relieves you of that pain almost immediately. For the best results, I suggest placing the black tourmaline where your dominant hand is, so if you’re left-handed you place the stone on your left. This can be on your left pocket, your left hand, left wrist or the left part of your desk. Selenite has the innate ability to cleanse anything around it, from your body and the crystals around it, so having a piece of selenite is very invaluable. Bringing selenite to work also has the ability to make it easier to hear what your spirit guides and angels are saying, guiding you to do the right thing. This is extremely important, as this usually can be difficult at a noisy and hectic workplace. Selenite is highly recommended for those who get annoyed or angered easily at work due to stress or claustrophobia from having a lot of people around you. And while we put black tourmaline on the left part of our area, it’s highly recommended to put selenite on the right part of the area. Think of the partnership between these two stones as having your bodyguard, your warrior (black tourmaline) and your spiritual protector, your angel (selenite). I wasn’t a firm fan of amethyst when I first started using healing crystals; maybe it just wasn’t the time for me to use it then. When I decided to finally get one for myself and bring it to work, all those doubts immediately went away for good. A deeply spiritual and cleansing crystal, the purple colour of amethyst plays a huge part in its ability to get rid out any sort of negative energy is interesting. Where black tourmaline keeps away the bad and the selenite clears you, using amethyst releases negativity from your body in a “flushing” sort of manner, almost as if it turns negative energy into water and flushes it out of your system, leaving you empty and cleaned up. Another fan favourite of many and yet another stone that I didn’t quite like in the beginning, maybe it was the pink colour that failed to attract me at first (masculine bravado, what a concept), but nevertheless, once put to the test, rose quartz turns me into one firm believer. Rose quartz is a good crystal for those who may be easily irritated or who, due to the stress of the workload or the weight of the petty politics between staff and co-workers, may have their heart closed up and locked in a steel cage. Meditating with a piece of rose quartz or just playing with it in your hand can help you feel its gentle energy passing into you, helping you breathe better and feel more compassionate and friendly towards your co-workers. A good friend of mine suggested something when choosing your own piece of rose quartz, and that is to choose the piece that has a calm and easy-going look inside it. Crystals inside usually look like water, so if it’s a technique that resonates with you, she highly suggests you to find a piece that looks like “a pink serene riverbank”. Bringing citrine to work has shown me two very strong and very different effects, but both very positive effects, too. If you’re a bit low on the funds, place a prayer on your citrine with the intent of helping you out financially and bring it to work. You never know what kind of offers you’ll randomly get. If you have your own business, it’s best to have a piece nearby you or where you keep your money so that it can attract abundance in the form of money. Citrine’s yellow colour correlates with the solar plexus chakra, which can help you maintain a cheerful and light disposition all day long. 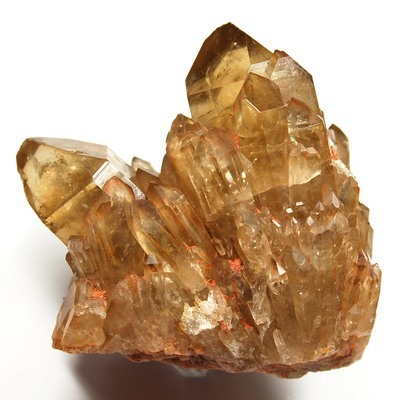 Like selenite, citrine never needs to be cleansed as it never keeps any negativity in it, so you can be rest assured you’re not keeping anything dirty in there! Note that there are two types of citrine in the market: the natural and the heat-treated citrine. Natural citrine is pure in colour, ranging from smoky shades of golden brown to a faint, almost clear quartz tint. Heat-treated citrine is amethyst heated up by miners to change the purple colour to orange to yellow. Note that this is only a guide for readers in knowing which crystals respond best to workplace situations and this shouldn’t be taken word for word. Always listen to intuition and personal voice when choosing crystals to work with. Choose crystals which will serve a specific purpose, may it be for calming, for better work productivity or for better communication skills.